Mortgage rates are low right now. Really low. 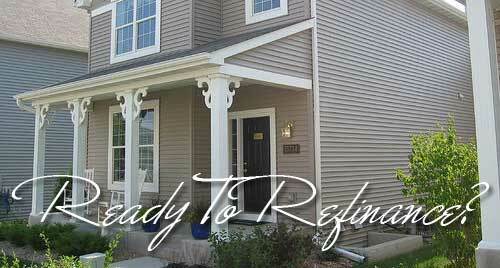 Indeed, for many homeowners, now is the perfect time to refinance. Credit requirements have loosened up a bit (compared to what they were for a couple years after the financial crisis). As a result, many people are interested in refinancing their homes. Before you head to the bank to look for your refinance, though, you should be prepared. Before you apply for a mortgage refinance, you need to know your credit situation. Do you have a good credit score, or is it a bit low? In order to get the best terms on your refinance, you need to have excellent credit. Check your credit report to make sure that there aren't unpleasant surprises, such as fraudulent or duplicate accounts. You should also be aware of how your credit utilization looks to lenders. If you are planning to refinance, it might be wise to stop using credit cards for awhile — even if you pay them off every month. Consider the information in your credit report, and get errors fixed. You can check your credit report for free once a year by visiting AnnualCreditReport.com. Proof of income and employment: You need to show that you can handle the new mortgage payments. This means proof of income and employment. Usually, this means pay stubs for the last 30 to 60 days, and a W-2. You might also need your tax returns. If you are self-employed, some lenders might require you to complete an income audit. Asset information: Many lenders want to see what assets you have available to you right now. This means you will need to bring documentation related to your bank accounts (checking and savings), retirement accounts, and investment accounts. 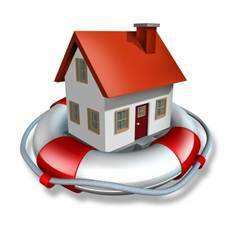 Homeowners insurance policy: Lenders want to know that your home is adequately protected. Your homeowners policy is proof of that. Title insurance: Additionally, your title insurance provides a description of the property, as well as the verifying you as the legal owner of the property. It will also serve to provide information about the taxes on the property. Appraisal: Your home will probably need to be appraised before a lender approves your refinance. You can either have the appraisal done ahead of time, or you can wait until the lender asks for the appraisal. If you do the appraisal on your own, make sure that the lender will accept it, and be sure that the appraisal is relatively recent, within the last 30 to 60 days. Lender requirements vary, so it's a good idea to call ahead of time and ask for what documentation the lender wants as part of the refinance process. That's exactly what their site is – a simpler, smarter and better way to invest. I loved pretty much everything about the site when i reviewed it. The fact that you can set up automatic deposits and invest regularly in good low cost ETFs, all while having your portfolio asset allocations regularly balanced for you, without your intervention. You just choose your allocation between stocks and bonds and let their service do the rest. Easy investing anyone can understand. The one thing that I wasn't super happy about were the annual fees that they were charging. Today, however, Betterment announced that they would be lowering their fees across the board. While I was using the site before, with the new lower fees I can wholeheartedly recommend investing with Betterment for just about everyone – even more so than in the past. Ok, so what are the new lower fees, and what were the fees in the past? In the past if you had anywhere from $0-25,000 invested with the service you would pay an annual management fee of 0.9%. $25,000-100,000 the cost would be 0.7%. $100,000-500,000 your fees go to 0.5%. With a balance of $500,000 or more, the fee was 0.3%. So the fees ranged anywhere from 0.3%-0.9%. Most of my readers are were most likely falling into the 0.9% annual fee bucket – and for me that wasn't a fee structure that made a ton of sense for most people. Betterment was good about seeking out feedback from their users and from personal finance bloggers, and today they announced a couple of big pieces of news. The first and most important piece of news was that they were dropping their fees across the board. As you can see from the chart above their fees are dropping, and the amounts you need to invest to get the lower fees has dropped. No minimum: You need to deposit $100/month and you'll get a 0.35% annual fee. No minimum, no deposit: If you can't commit to $100/month, you'll be upgraded to the “Better” plan with next day deposits, and be charged $3/month. $10,000 minimum: You'll get a 0.25% annual fee and next day deposits. No required monthly deposit. $100,000 minimum: You'll get a 0.15% annual fee, next day deposits and if you want, a custom portfolio. No required monthly deposit. So the fees went from where most people were paying a 0.9% fee, to a situation where most people are going to be paying anywhere from 0.25%-0.35%. That's quite a drastic drop in fees, and it will save people a lot of money! I think it makes Betterment extremely attractive to newer and seasoned investors alike. Another change that happened a little while ago was that Betterment started including some international ETF funds in their investment mix. If you look below you'll see what Betterment currently invests in, with the newer international ETFs in bold. I know a lot of folks were clamoring for them to include more international stocks in the mix, so I think it's great that they've diversified the holdings in that way. Finally, Betterment announced today that they're opening up tax advantaged IRA accounts for all users now on their site. Previously this option was only available for current customers. You can now open up a traditional IRA or a Roth IRA, and if you're leaving an old company, you can perform a 401k rollover and use Betterment as your IRA custodian. I loved Betterment before and signed up to use them, despite that I wasn't 100% happy about their costs/fees. Now that they've lowered their fees drastically and made them super competitive, I really don't have any major reservations about their service anymore. I can wholeheartedly recommend Betterment now, and I would recommend them to friends, family and anyone else as a great place to invest. 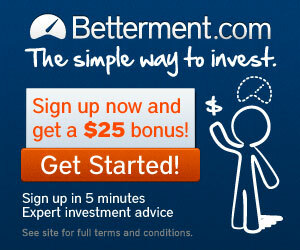 Get a 30 day free trial & $25 bonus with your Betterment account. Could An Annuity Be The Ticket To Reliable Retirement Income? With the 2008 financial crisis still fresh in some minds, one of the questions many are asking is this: Is there a way for me to protect my nest egg from market drops during retirement? One of the financial tools receiving a second look right now is the annuity. However, annuities have something of a bad name right now because so many of them are complex and costly. But that doesn't mean that all annuities are bad, or that no one should ever get one. There are some annuities worth considering, and some retirees, with the right annuity, can do well incorporating one into the retirement strategy. One of the types of annuities gaining in popularity is the fixed indexed annuity. This is an annuity that promises a fixed rate of return (usually pretty low), but that also leaves the door open for greater returns because the annuity follows an index. So, you are protected from loss because there is a minimal rate of return, but at the same time there is room for you to see better returns because the annuity's performance is connected to how a specific index performs. You can choose to invest in the annuity before retirement, and build up to a payout later, or you can choose to get an immediate annuity. With an immediate annuity, you take part or all of the money in your retirement account and use it to purchase an annuity which begins offering regular payouts immediately. You have a fixed income stream now, and it can be used to fund you during retirement. Stability of the company: Annuities are offered by insurance companies. If the insurance company goes down, you risk losing your money. A minimum guaranteed rate of return is no good if the insurance company goes down. There are some state funds that offer insurance against this sort of loss, but you do need to be careful. Check ratings and determine the strength and stability of the company. Costs: All annuities come with fees. However, some annuities have higher fees than others. Find out about total yearly costs, as well as costs associated with mortality and other issues. You might need to pay additional fees for extra features. Inflation adjustment: Find out if the minimum guaranteed return will be adjusted for inflation. A 2% guaranteed annual return still results in a loss of spending power if inflation is at 3% or 4%. Look for annuities that offer inflation adjustments. Surrender period: Make sure you are clear on this, and the terms of how you can withdraw money from your annuity. Otherwise, you might find yourself racking up extra fees. Like many financial products, annuities aren't all bad. They are worth considering, and, when used properly, they can provide you with a way to ensure retirement income. Where Do You Get Better Returns For Short Term Savings? A Bank CD Or A Lending Club Account? The other day I was looking at my Lending Club account and reveling in my current 11.45% net annualized return, and I started to think about how the returns were so much better than what I was getting from my savings account or CDs at a traditional bank. While there is the added risk of investing in peer-to-peer lending, if you manage your risk properly, you'll easily be able to make in excess of 10% returns. So the question is, why don't more people use Lending Club like they would a regular savings account or CD when they won't be touching the money for a few years anyway? Why not use Lending Club and set up something similar to a CD Ladder? So let's look at what kind of returns you can expect to receive from a CD account. Let say that I invested my money in anywhere from a 3 to a 5 year CD from one of my favorite online banks – Ally Bank. You could expect to see returns in the range of 1.35% (3 year) to 1.74% (5 year). So let's say that you put $10,000 in the 5 year CD at a rate of 1.74%. After five years you would see that money grow to be about $10,908 or so. So you'd see a return of about $908 for leaving your money in the account for 5 years. Not exactly impressive. Putting your money in a 3 year CD at 1.35% would net you about $555 or so. Now, let's say you take that same $10,000 and put it in a savings account. Most savings accounts aren't earning more than 1% right now. Let's use my Ally Savings account that I currently have our emergency fund in – it's earning .84%. So let's say we put our $10,000 in there for 5 years, we'll see gains of $430 in that savings account over 5 years. Saving for 3 years would only net us $256. Now let's look at my Lending Club account. If I had $10,000 invested there over the same time frames, earning my current rate of interest (11.45%) I'd be seeing returns of about $4,338 for 3 years, and $8,230 for 5 years. That is quite a difference! Even if we just use Lending Club's advertised average return of 9.6%, you would still see returns anywhere from $3,495 t for 3 year to $6,481 for 5 year. Admittedly these numbers aren't 100% as rates change, Lending Club loans have defaults and other things, but it gives a general idea of how great the difference would be. The difference for a 5 year Lending Club account at my current rate, and a 5 year CD would be around $7,322. The difference for a savings account is even greater at $7800. That's a nice chunk of change! No FDIC insurance: With Lending Club your money isn't FDIC insured, so you could always lose it all if all your loans defaulted, or something else crazy happened. The likelihood of that happening, however, is pretty low. Low liquidity: With Lending Club your money isn't very liquid. In order to get access to the money you'd have to sell your notes on the secondary market, most likely for less than they're worth. Of course there are penalties for withdrawing money from a CD early as well. But I wouldn't recommend putting money there unless it wasn't money you didn't need right away. A bit more work: It may take you longer to find enough loans to buy with your $10,000 initial investment. The time it takes could mean lower returns during that time period. It will also be more work than just transferring your money over to a savings account or CD. You'll have to actively find and buy loans to add to your portfolio. Despite the downsides above, I still think the awesome returns you can see with a Lending Club account are well worth the added risk and work associated with having an account. Of course the other option is to take that $10,000 and invest it in a low cost index fund with Vanguard or another investment account, but I think it's not a bad idea to add Lending Club to a diversified investment strategy – of which stocks and peer to peer lending are a part. What are your thoughts? Have you considered taking money that may have traditionally just sat in an CD or savings and moving it to Lending Club? Are You Falling Victim To Price Anchoring? One of the ways that you might be wasting your money could be due to the effects of anchoring. Anchoring is one way that retailers and others try to get you to spend more than you might normally spend. 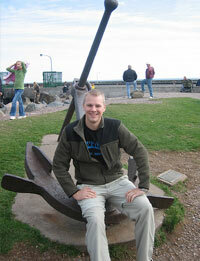 The effect of anchoring can also be seen in your other financial decisions, including investing decisions. The idea of anchoring is that you use a value you know to make a decision about something you may not know about. Often the anchor price or value does not actually have a bearing on the actual value. When anchoring, people base decisions or estimates on events or values known to them, even though these facts may have no bearing on the actual event or value. Anchoring can affect the way you make money decisions in your daily life, as well as in more long-term situation. One of the most common ways anchoring is used is to encourage you to spend more money than you normally would. This can be related to the idea of buying something in a “middle price range.” Something expensive will be presented next to something that is less expensive (but still not the least expensive). The idea is to get you to purchase something that is pricier than you would purchase normally. Anchoring works at stores, when you see something expensive. That price for the item is “anchored” in your mind as something that you can expect to pay. So, when you see something next to it that is a little bit cheaper, that item suddenly seems like a good deal. The cheapest version of the item might work just as well, but it suddenly seems too cheap. Is there something wrong with the quality? Instead of getting the cheapest possible item, you go with the mid-range price. It feels like a good deal because you didn't pay the highest price, and you also feel good because you didn't “cheap out.” You feel like you got a good value, even if you probably would have saved money and still been fine with the lowest priced item. Anchoring in investing is another issue. During times when your stock is losing value, Investopedia points out, you might be inclined to hold on to the stock because you want to at least “break even.” You don't want to sell until the stock at least reaches the price you paid for it. This is another form of anchoring. In your mind, the stock is “worth” a certain amount because that is the price at which you bought it. Even if the fundamentals have changed, and you should cut your losses (or harvest them for tax purposes), the “worth” of the stock is anchored in your mind. Anchoring also works on a wider scale in the markets. A stock might remain stubbornly high because a certain expectation for price has been promoted. This could very well be seen in the Facebook IPO. There is already an expectation of what the stock should be valued at, so the market could easily adhere to the principle of anchoring when Facebook becomes publicly available. It's up to you to recognize anchoring situations. Instead of letting a fixed price set the value, consider what you want to pay before you head to a store or restaurant. Do research on investments to avoid letting your emotions rule you too far when making buy and sell decisions. Be aware of the effects of anchoring, and work to combat them.